Some vegetables are just more popular than others. People positively moan at the mention of mushrooms, others recount their favourite tomato sauce recipe immediately when asked. 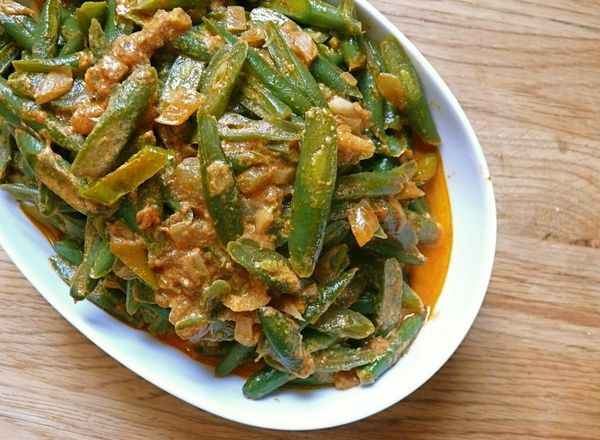 But when was the last time you craved green beans? I don’t think they conjure the harsh dislike that mushrooms or tomatoes can either, but I get the sense that people feel lukewarm toward them for the most part. 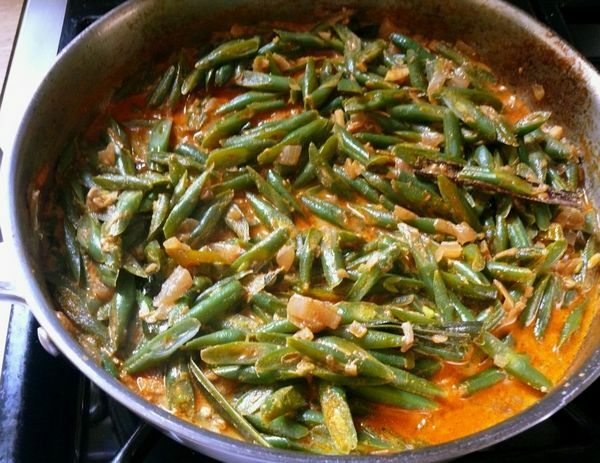 For me, green bean greatness is are all about how they are cooked. I have three favourites. There is a Hakka method where they are fried, or rather poached in oil and doused in salty black beans. There are my mom’s fried beans, which are chopped finely and sauteed with onions till sweet and brown. But best of all are these, her curried beans. 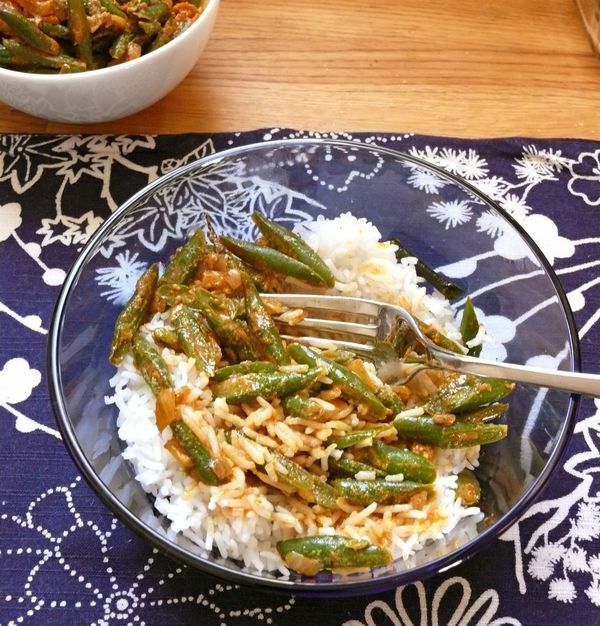 These beans on a bed of rice make a completely satisfying and addictive dinner on their own. If you’re making them in a hurry, you can line the beans up and dice them, but cutting them on a (not-too-thin) bias is more flattering and the texture in the finished dish is superior too. You’ll probably find, as I did, that the only way to get there is to cut one, maybe two at a time, which takes a little longer. Worth it for when you’re making a special dinner, like when you’re serving these with yellow rice. 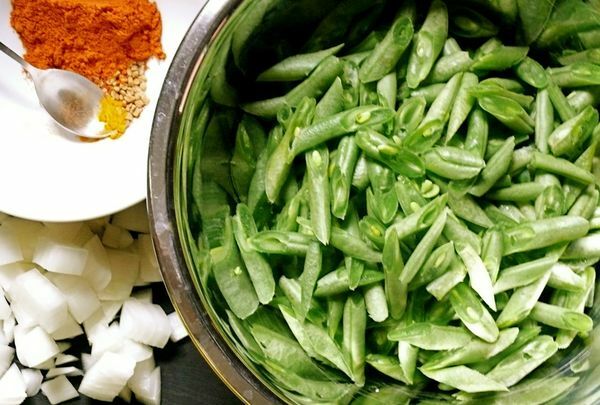 I never knew pandan was used in Sri Lankan cooking! thanks, su-lin! i never think of them as pandan leaves and i wish i had called them that before. im going to go back to add that name to other recipes that reference rampe to make them more accessible! Yasmin, this recipe is delicious. Sure I made some pretty big swaps (had no coconut milk so I used some dollops of tahini instead), but that’s some fast comfort food. Looking forward to making it 100% your way next time! very interesting, yet not that surprising, is it? i love hearing about similar dishes from very different cultures. does the one you know have any unique ingredients or spices? the beans youre describing are the kind i love! id love to hear more about that spicy garlic sauce!